Last August, after three months of wearing Google Glass, talking to it and having it talk back to me, I had an epiphany, a revelation, and I wrote this post: Voice is the new touch, or in other words, in the near future, every piece of software and every piece of hardware will include or add a new layer of voice. In the same way now customers demand an app with touch screen for cells and tablets, after experiencing this new come back to natural interfaces such as voice customers will expect and want voice everywhere, they'll demand voice, and we developers will have to add a new layer of voice to all of our apps. 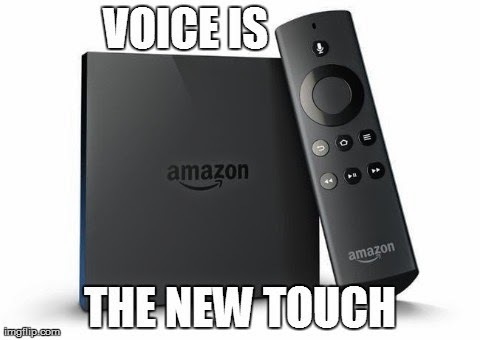 Amazon fire TV is the perfect example of what I meant by Voice is the new touch in the level of a hardware piece.